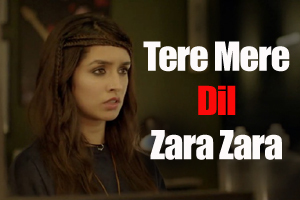 Beautiful love song in the lovely voice of Shraddha Kapoor featuring her and Farhan Akhtar. The video of this song is available on YouTube at the official channel Zee Music Company. This video is of 2 minutes 31 seconds duration. The lyrical video of this song is also available on YouTube at the official channel Zee Music Company. This video is of 4 minutes 11 seconds duration. Lyrics of "Tere Mere Dil Zara Zara"
Lyrics in Hindi (Unicode) of "तेरे मेरे दिल ज़रा ज़रा"